A survivor of "conversion therapy" tries to find a church that doesn't just tolerate, but embraces. As head of advocacy and government affairs for the Trevor Project, the world’s largest crisis intervention and suicide prevention prevention for LGBTQ youth, I am no novice to the idea that many of the young people who call our 24/7 Lifeline are feeling rejected by their faith communities just like the one I was worshipping in. Every day, we hear about pain and sorrow caused by churches rather than the joy and hope a faith community could be offering. I hear that pain, but I also feel something so different. I am a proud genderfluid bisexual Christian. So I walked into that Easter Sunday church service with prayer and longing to find a home. I had scoured the website of this church, as I am seeking a new church home, looking for any clues if it was welcoming and affirming. “Welcoming and affirming” is the common language that we in the queer faith community use to demonstrate that a church not only recognizes that LGBTQ people deserve respect, but also the affirmation that they are equally loved by God regardless of who they love or how they identify with their gender. And so I worshipped. I listened intently to the sermon. I prayed. I was welcomed by the congregants beside me during the fellowship time. I put a dollar in the tithe bucket. I can’t describe how much I was certain God wanted me in this room. It was palpable. The pastor asked those of us who were new to stop by an informational section after the service, so I hurriedly walked there as the church service ended with a sense of hope and happiness. I was back. 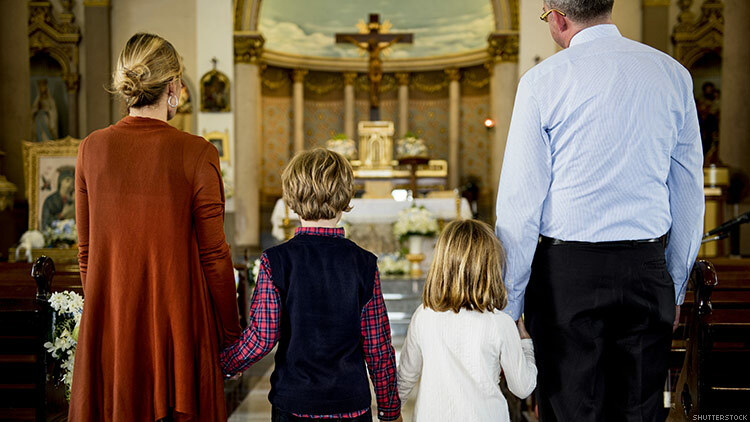 I was in a church that I could see myself coming to and bringing my children to (whenever I have them). I smiled as I asked the lovely church lady if she could tell me if the church was welcoming and affirming. She paused. She looked me in the eyes and told me that although all are welcome, it was in the hope that they would leave “that life.” She had no idea how painful that would be for me to hear. Leaving “that life.” Praying the gay away. “Ex-gay“ ministries. “Reparative“ therapy. “Conversion“ therapy. She had used a dog whistle without knowing it. I know exactly what that means. You see, I am a survivor of the dangerous and discredited idea that a therapist or a pastor can change an LGBTQ young person into a straight or cisgender young person. I literally lead the largest national campaign against conversion therapy. I started to cry. She grabbed my hands and realized just how wrong she had been. She begged me not to walk away. “I was wrong,” she wept. “Let me have a pastor explain it better.” Again she begged me not to just walk away. When the pastor arrived to welcome me, I asked the same question. He confirmed that this was a welcoming church. “You should always feel welcome,” he said as I wiped away my tears. “But I can’t say we are affirming.” He assured me I would not hear condemnation and told me he would love to learn more and promised he would respond to any problems I had. He also clarified that the church does not condone conversion therapy. I thanked him for the clarity and tried to get out of the church before I would start crying again. I’ve had time to process this afternoon. I ate Easter dinner with friends and smiled thinking about the community I built around me. I made up my mind: I have a new mission field. My parents were missionaries and we traveled the globe spreading the good news of Jesus Christ. I am going to spread the good news of affirmation. In that church. Every Sunday. We talk about toleration and acceptance in the LGBTQ activism world. We find toleration to be offensive. I think I found the religious equivalent. Accepting but not affirming is a space where LGBTQ youth can think that that is all they deserve. If you are a young person reading this: You are not alone. The Trevor Project is here to help whenever you are feeling alone. And you are not alone in that church. This missionary kid is going back to the mission field. It just happens to be in my neighborhood. I often say that I am broken glass because of the damage conversion therapy caused. Today I say that broken glass can still be beautiful, especially when used to create an ornate window shining beautiful rainbow light into the most holy of cathedrals. SAM BRINTON is the head of head of advocacy and government affairs at the Trevor Project.